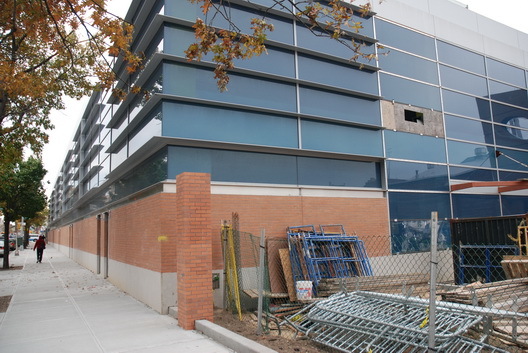 This is the Con Edison building on Fourth Avenue that has been under construction forever. 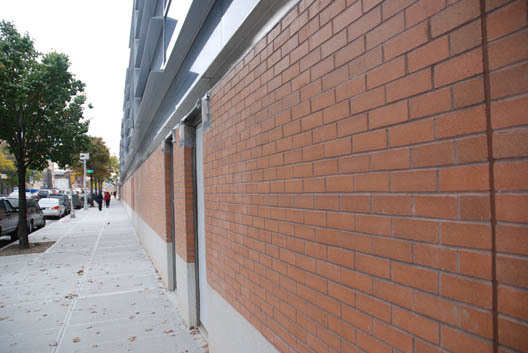 The horrendous brick wall at street level could be in a planning and architecture textbook as an example of what not to do in terms of streetscape and street-level design. We're certain there's a reasons for this fortress-like exemplary use of brick at street level, we're not certain what it is, however. The building is slightly--but not entirely--less atrocious once the eyes rise above the first floor. However, it's expanse of brick, broken only by solid steel doors, at street level that boggles the mind. This is the stretch of Fourth Avenue that developers of buildings like the Crest on Second Street, directly across Fourth, and the Novo Park Slope are trying to market as the Park Avenue of Brooklyn. Upon further consideration, it may fit in quite nicely. It's because it's just a fagged-up garage, knucklehead! Whaddaya want, windows so one can see the Con Ed guys playing cards or changing the oil? ConEd and Verizon have a poor history in making such buildings integrate with the neighborhood. Usually, they do have certain agreements with the city and state to satisfy certain design criteria. For example, have you ever noticed that awful Verizon logo on that building downtown (when you are on the subway riding across the Brooklyn Bridge)? Verizon agreed never to do that when they put up that building. can you remove the "fagged-up" part of the comment above? it makes me wonder that you thought that was appropriate to begin with. trains don't go across the brooklyn bridge.